The WiVi Central Coast Wine Industry Conference & Tradeshow’s third annual event returns to the Paso Robles Event Center Tuesday and Wednesday, March 17 and 18, and organizers hope to draw winemakers, grape growers and hospitality managers to network and explore resources available on the Central Coast and beyond. Garagiste Festival Photo/Receiving the $20,000 check were Cal Poly Wine and Viticulture Department Lecturer Shohreh S. Niku, second from left, and Interim Department Chairperson Marianne McGarry Wolf, second from right. 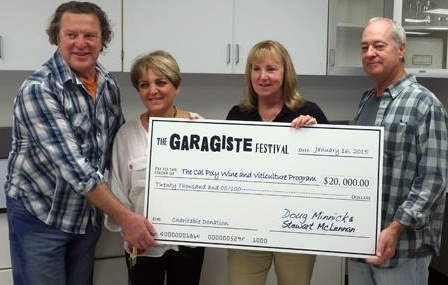 Garagiste co-founders Stewart McLennan and Doug Minnick are far left, and far right, respectively. Alma Rosa Winery & Vineyards, located in the Sta. Rita Hills AVA, has added two new employees to its team. They are Tom O’ Higgins, general manager, and Elaina Kroll, national sales director. O’Higgins most recently worked for V. Sattui in the Napa Valley, and Kroll in national sales for Domaine de Cristia, and represented McPrice Myers and the Barrel 27 line. O’ Higgins has deep roots in the wine business, having enjoyed stints in France, both in Bordeaux and in Epernay, and with several Napa Valley and Central Coast wineries. He will oversee daily operations at Alma Rosa, working closely with the Sanford family, Richard, Thekla and their daughter, Blakeney. Kroll will manage national sales for the Alma Rosa brand, and work closely in tandem with the Sanfords, ‘O Higgins and winery owner Robert Zorich to elevate the Alma Rosa portfolio. It’s official: Drake Whitcraft is now full time winemaker and visionary behind Whitcraft Winery, founded by his father, Chris Whitcraft, in 1985. Chris Whitcraft died earlier this year. Since its inception — long before the now-popular Funk Zone in Santa Barbara, which houses it — Whitcraft has built its reception on small-lot pinot noir and chardonnay. In 2006, barely into his 20s, Drake Whitcraft started making wine full-time at the family-owned winery. In more recent years, his father took more of a back seat to Drake’s growing love and obsession for what he considers to be his vocation: “If I weren’t a winemaker, there is nothing else I would want to do, save perhaps make music. My band mates and I have our instruments set up in my cellar, so between jamming with them and making the kinds of wines I want to make and drink, I’m probably the most blessed guy on Santa Barbara’s beach front. 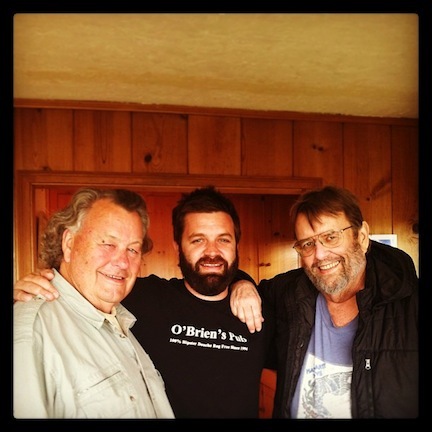 From left are Burt Williams of Morning Dew Vineyards, Drake Whitcraft and the late Chris Whitcraft. Whitcraft has worked with new vineyards in recent years, including Presqu’ile and Pence in Santa Barbara County, and Morning Dew in Anderson Valley. He is also sources from the same vineyards his father utilized, including Melville in Sta. Rita Hills. “It’s refreshing to see a young winemaker like Drake Whitcraft making great wine while still following the concepts his father established, which set Whitcraft apart as a unique winery,” said mentor and family friend, Burt Williams, of Morning Dew Vineyards. Listen up! Since the inaugural sparkling wine festival, BUBBLYFEST by the Sea, has nearly sold out, organizers are urging would-be attendees to buy tickets NOW. Already snatched up by your friends and neighbors are the three-day weekend VIP tickets and Sunday’s Funday Champagne Brunch. Nearly sold out are Friday evening’s Cocktail Mixer and Saturday’s Grand Tasting. Brisk sales have surprised even veteran event organizer Holly Holliday, who attributes the scarcity in tickets to the fact that her Create Promotions’ event is the only one of its kind in the nation. For tickets and more information, visit www.bubblyfest.com. Friday-Sunday, June 20-22 — Key to Wine Country: Santa Barbara Vintners has taken the former “Vintners Visa” passport add-on from its festivals (Vintners and Celebration of Harvest) and created a stand-alone event, “Key to Wine Country.” Enjoy special dinners, vineyard hikes, library and vertical tastings, open houses and more. Tickets are limited. For tickets and details on participating wineries, visit https://www.sbcountywines.com. This week’s preliminary 2013 Grape Crush Report revealed that California’s wine grape industry produced 4.23 million tons of fruit — a crop that tops the record haul set in 2012. The production of red wine grapes rose by 5 percent in 2013, yielding 2.41 million tons, while white wine grapes’ figure was 1.83 million tons, 6 percent over that of 2012, according to the state’s report. Add table grapes to the mix, and the total rises to 4,685,075 tons crushed. The state’s most popular grape continues to be chardonnay with 16.1 percent of the volume crushed. Second is cabernet sauvignon with 11.1 percent. Thompson Seedless grapes led the pack of table grapes with 6.2 percent of the total tonnage crushed. The average per-ton price of red wine grapes was $842 — 4 percent less than last year’s. For white wine grapes, the average price was $620, less than 1 percent below the 2012 average. Let’s compare highest with lowest price per ton: District 4 (Napa County) was highest, with $3,691.07, and District 13 lowest with $339.55 per ton. Take note: District 13 is no wee lot — it comprises Madera, Fresno, Alpine, Mono and Inyo counties, as well as Kings and Tulare counties north of Nevada Avenue (Avenue 192). District 13’s total haul equaled 1,588,985 tons. In addition, more vines were planted in District 13, translating to an 8 percent increase in its total tonnage. Most of the state’s 17 districts saw an increase in growth. District 2, Lake County, provided the highest percentage with an increase of 24.1 percent, or 43,209 tons of wine grapes. 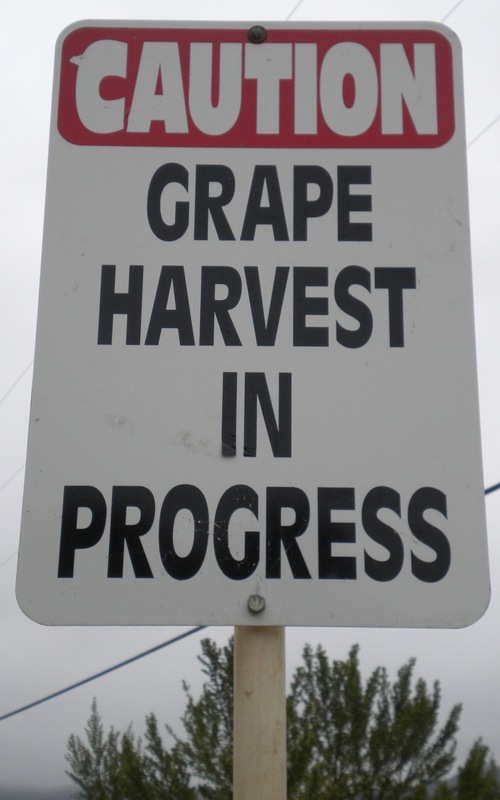 District 8 — Santa Barbara, San Luis Obispo and Ventura counties — harvested 10.5 percent more grapes in 2013 than in the prior year with 241,405 tons, the report noted. The California Office of USDA’s National Agricultural Statistics Service (NASS) and the California Department of Food and Agriculture (CDFA) turn figures provided by the state’s vintners into this annual report. Despite the relatively small amount of rain the Central Coast received last week, I have seen a few green shoots sprouting up from the brown hillsides and along our roads. Many local vineyard owners used their overhead sprinklers to soak the vines in the weeks before the our recent rains. They no doubt feared the worst, as day after warm day of sun continued to parch the lands. This week, the vineyards I pass on a near-daily basis — Duvarita, Kessler-Haak, Clos Pepe, Zotovich, Melville, Babcock and Ampelos — have at least the beginnings of lush green carpets from vine row cover crops.